I love the whole outfit colors,everything.! I’ve got more compliments than any other bedspread set . Very well-made Great quality. 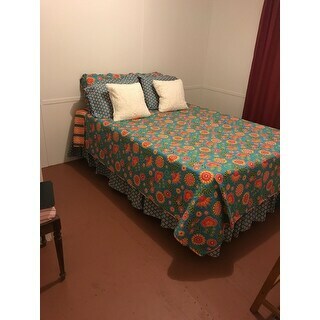 Our Gypsy Floral Full or Queen Reversible Quilt Bedding Set Includes: 1 Reversible Quilt, 2 Ruffled Pillow Shams, 2 Pillow Cases w/ties, 2 Decorative Throw Pillows, and 1 Full or Queen Sized Bed skirt. Our 100 Percent Cotton Reversible Quilt comes in the floral print, trimmed in a matching multi-colored stripe and reverses to the same trim fabric (Full/Queen Quilt Measures 90 inches x 86 inches).Our standard ruffled pillow shams come in the large floral print; the standard pillowcases come in a small flower with matching ties (Sham Measures 20x26 + 1.5 inch Ruffle, Pillow Case 20x26). Decorative throw pillows come in a soft Ivory Faux Fur Minky (Measures 16x16). The Gypsy Full or Queen Bed skirt comes in the small flower print (Full Measures 75x54x15 inch drop, Queen Measures 80x60x15 inch drop). Wash on gentle cycle, separately in cold water. Tumble dry low or hang dry. Spot clean décor pillows. Transform your present Cotton Tale Gypsy Nursery into a lovely bedroom for the next phase in life. Cotton Tale's plan is a perfect solution for converting to a Twin, Full, or Queen Bedroom and at the same time keeping the appropriate items already present in your Gypsy Nursery. Just by adding a few bedding décor items your room can quickly transform. Go beyond the nursery with our Full or Queen bedding set, a perfect collection for any room.